Since 2013, Sovereign Pest Control Southwest has been operated by Chelsea and Garrett Hollingshead. Chelsea and Garrett are both Certified Pest Applicators in the state of Texas. Chelsea is an army veteran and serves in the Army Reserve. Garrett has a degree in Psychology from Weatherford College. They have extensive experience in providing termite, pest control, and mosquito control in the Austin and San Antonio area. Having just started their own family, Chelsea and Garrett know the importance of carefully providing trusted and effective service to our customer’s homes. Please follow Sovereign Pest Control Southwest on Instagram @chelseagarrettspc. Chelsea and Garrett will be posting information on monthly specials, coupons, tips for homeowners, and local pest issues. 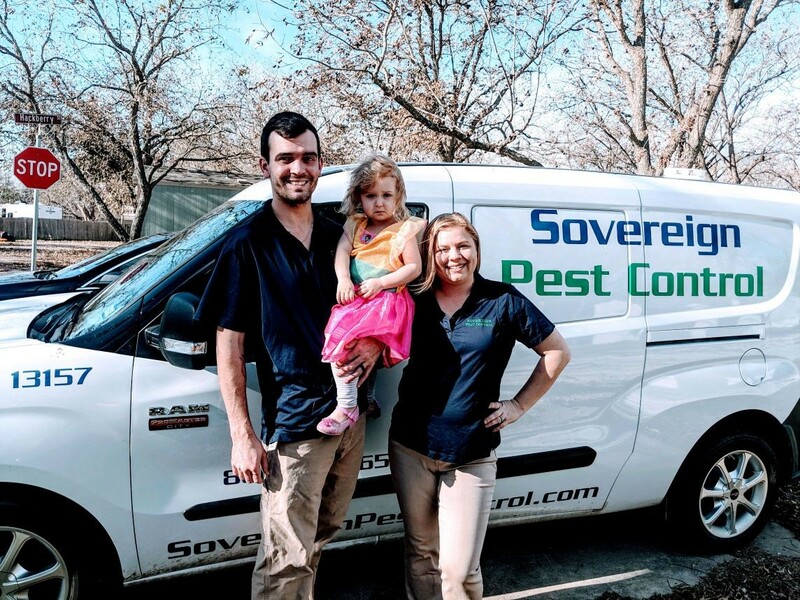 You can also help Chelsea and Garrett expand their business by telling your friends, family, and neighbors about Sovereign Pest Control Southwest. You can earn $50 to $100 when you refer-a -friend and they purchase one of our Signature Service Plans. Sovereign Pest Control does not believe in multi-hour appointment windows. That is why we schedule Exact Time Appointments. All appointments are scheduled on the hour. We respect our customers’ time and want to make it easy and convenient to schedule service. Sovereign Pest Control utilizes a customized software system for appointment routing, scheduling, and tracking. The objective of this system is to ensure on time appointments between our technicians and customers. This division of Sovereign Pest Control utilizes GPS tracking to manage our technicians and support them in arriving for their appointments on time. Sovereign Pest Control will bundle the initial inspection, termite service, pest control service, and pet lovers service at a reduced cost. Two-year service plans are given a discounted price. Sovereign Pest Control efficiently uses pesticide applications by only providing services deemed necessary. This process is environmentally friendly. Monthly installment payments are available for Sovereign Pest Control customers, without accruing interest or finance charges. The maximum number of installments for the 1-Year Plan is 8 installments. For the 2-Year Plan, the maximum number of installments is 18. 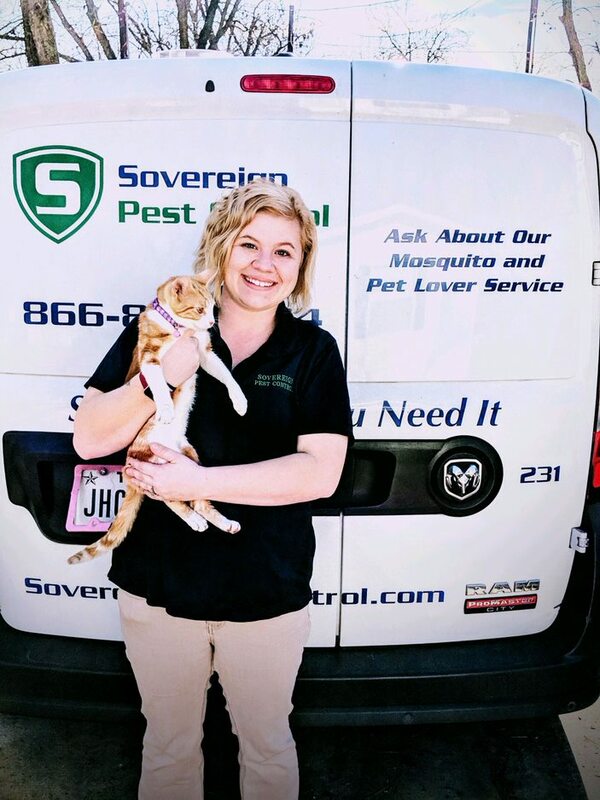 Managers at Sovereign Pest Control managers have over 100 years of experience and have been licensed in multiple states. We specialize in residential termite and pest control. We service over 40,000 homeowners each year and we work very hard at providing superior customer service. Our customer service department is available Monday through Friday between 8:00 am and 8:00 pm. Sovereign Pest Control is committed to reducing the amount of paper used by 90% throughout our entire organization. Our efforts include the development of a paperless customer contact system, re-cycling paper products, and an ongoing effort to get rid of all internal paper forms.